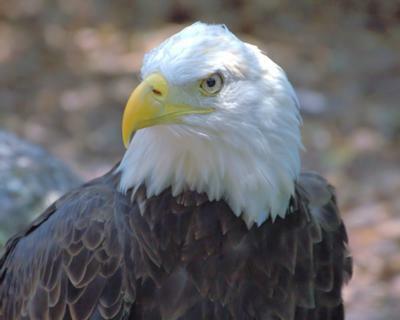 Forrest Elmslie, the Owner/Operator of "For the Birds" Bird Sanctuary, located off Gore Road, between Colchester and Harrow, sent us this report - On April 23, 2010, we discovered a pair of Bald Eagles nesting in the bird sanctuary. The nest is huge, and they have obviously been building it for many weeks. Viewing at the Bird Sanctuary has now been roped off, so the nest won't be disturbed. The closest spot to observe the nest is 300 feet away. The Sanctuary is open to the public and a $5 donation is requested. Saturdays & Sundays 7 a.m. to 7 p.m.
For more information visit For the Birds website or call 519-735-4997 or 519-984-4997, and for upcoming events at the Bird Sanctuary, check out their Events Calendar. Bald Eagles article in the Windsor Star on April 27th 2010. Just a reminder to our readers that "For the Birds" is a Bird Sanctuary, and is not a public picnic area or playground - the owners want to make your bird watching experience as comfortable as possible, and have installed seating along the over 4 km of trails for your convenience.